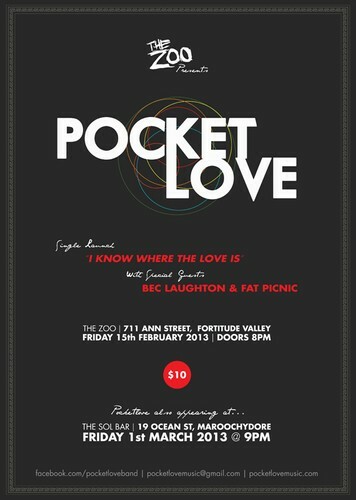 The nuclear fusion of pop-rock and soul PocketLove is back in 2013 to release of their bran' spankin' new single "I know where the love is", alongside Brisbane dance heavyweights the Fat Picnic, and Qmusic award winning soul-pop diva Bec Laughton, for a floor breaking dance extravaganza at the Zoo on Friday 15th February. 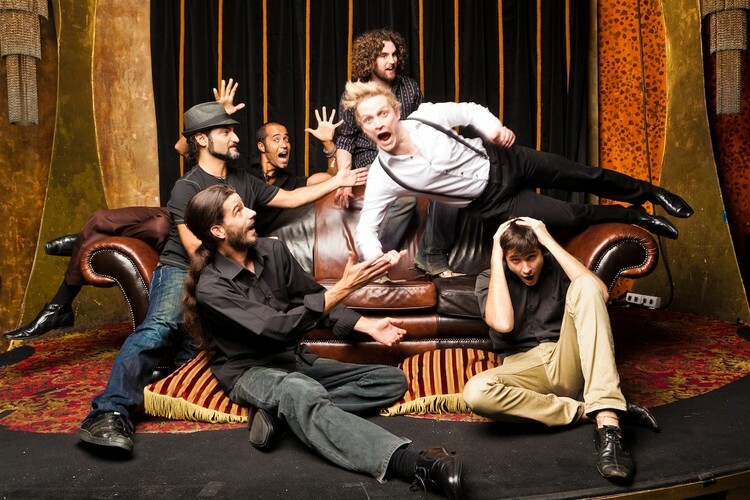 An unexpected change of lineup last year almost permanently put the breaks on PocketLove continuing in 2012 with the loss of their original lead singer Travis Lee. "It was a bit of surprise when Trav decided to leave for Melbourne last year" Turbo PocketLove's guitar guru explains "Especially just after we had played the main stage of Caloundra Fest before then and released our first EP". "Luckily there was a lot of interest in filling that spot after our success in 2011 and soon after we got the world class angelic vocals of Luke Kennedy"
He elaborates "He just got off a long tour with the Ten Tenor's as their rock singer and wanted to do some original music with us which has turned some freakin' awesome tracks!”. 2012 was spent getting the band’s new mojo together and recording the new tracks with Luke’s vocals. The tracks were then mixed at Rocking Horse Studios by the track-melding virtuoso Anthony Lycenko. Turbo explains "We wanted a real professional sound for the new tracks and Anthony has knocked the ball out of the park on this one". The bands latest track ‘I Know Where The Love Is’, features a mixture of down and dirty funk rhythms, catchy horn lines and Luke's powerful vocals and marks an evolution of the bands sound towards something more steeped in funky rock/pop rather then their trademark straight funk. "Luke has definitely had something to do with that" Turbo explains "It's always great to collaborate with people with new ideas otherwise you tend to go down the old songwriting paths". He sums up his point perfectly "You have to evolve or die".